You may not have seen someone break out the two-handed heart symbol since the late 90’s, but Google is looking to bring it back sometime soon. 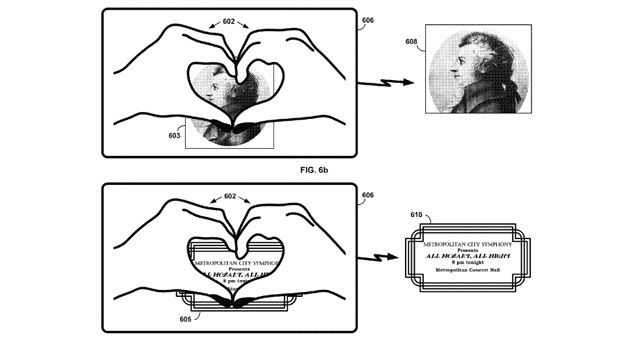 The list of patents that Google has stored away for their Glass experiment is a long one, but the newest one allows users to signal Glass to save moments by putting your hands up in the heart symbol in front of you. How romantic. This patent was caught sneaking through the USPTO with Google’s name all over it. Making this hand gesture in front of the Glass’ built in camera will signal the device to snap a picture so you can remember your significant other, beautiful sunset or that delicious burger with ease. There is no telling that Google will ever implement this into Glass, but it would be a pretty cool feature down the road. What other hand gestures could you think of Google Glass using?